But here on Earth there'd be no life, Without the light it gives. The sun is a quagmire. It's not made of fire. Forget what you've been told in the past. (Plasma!) Electrons are free. (Plasma!) A fourth state of matter. Not gas, not liquid, not solid, Ooh! (Plasma!) Forget that song. (Plasma!) They got it wrong. That thesis has been rendered invalid. This page is not about the color of pinkish-purple. Nor is it about those small, charming varieties of flowers that are known to attract butterflies. Nor is it about unintelligible webcomics. Or bloodstone. This is about the other Helios. And tropes about it. Okay, okay, enough beating around the bush. This index is for tropes regarding The Sun. It chases away the night. It has been the focus of religious worship on every continent. It provides nearly every living thing on Earth with the energy it needs to survive. It is responsible for the very existence of our planet. It is Sol, The Sun, our mother star. And, naturally, it features prominently in the stories told by virtually every culture on earth. Vampires fear it. Heroes ride into it (and occasionally blow it up). When killing something with fire simply isn't enough, what do you do? Hurl It into the Sun! Compare This Index Earth, This Index Is on Fire, Index on the Moon and Stellar Index. Binary Suns: A solar system with two suns. Endless Daytime: Day that never ends, and a sun that never sets. The Face of the Sun: An anthropomorphized sun with a human face. Grasp the Sun: A character about to attempt a superhuman feat mimes grasping the sun. Hurl It into the Sun: Destroying something by chucking it into a sun. Night and Day Duo: Day/Sun characters contrasted with Night/Moon characters. The Power of the Sun: Sun-themed Elemental Powers. Sinister Sentient Sun: Evil living suns and sun-like beings. Solar and Lunar: Contrasting sun and moon motifs. Solar CPR: Reviving a dying sun. 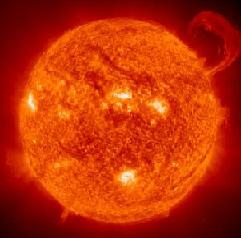 UsefulNotes.The Sun: Useful Notes about our sun. Weird Sun: Some fictional suns can be very strange indeed.